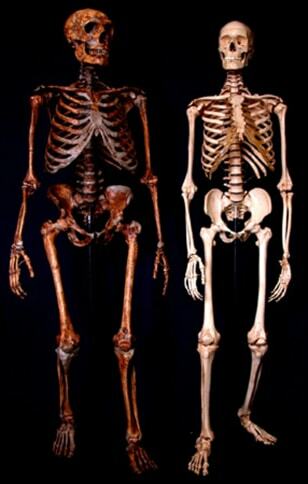 The Neanderthal skeleton, at left, is compared with a modern human skeleton. The Neanderthal male was thought to stand 5-foot-6 (168 centimeters) and weigh 142 pounds (64.5 kilograms), with a brain size of 1,200 to 1,700 cubic centimeters. The human male averages 5-foot-9 (175 centimeters) and 172 pounds (78 kilograms) in weight, with brain size of 1,300 to 1,500 cubic centimeters.